When computing descriptors of image data, the type of information that can be extracted may be strongly dependent on the scales at which the image operators are applied. This article presents a systematic methodology for addressing this problem. A mechanism is presented for automatic selection of scale levels when detecting one-dimensional image features, such as edges and ridges. A novel concept of a scale-space edge is introduced, defined as a connected set of points in scale-space at which: (i) the gradient magnitude assumes a local maximum in the gradient direction, and (ii) a normalized measure of the strength of the edge response is locally maximal over scales. An important consequence of this definition is that it allows the scale levels to vary along the edge. Two specific measures of edge strength are analyzed in detail, the gradient magnitude and a differential expression derived from the third-order derivative in the gradient direction. For a certain way of normalizing these differential descriptors, by expressing them in terms of so-called γ-normalized derivatives, an immediate consequence of this definition is that the edge detector will adapt its scale levels to the local image structure. Specifically, sharp edges will be detected at fine scales so as to reduce the shape distortions due to scale-space smoothing, whereas sufficiently coarse scales will be selected at diffuse edges, such that an edge model is a valid abstraction of the intensity profile across the edge. Since the scale-space edge is defined from the intersection of two zero-crossing surfaces in scale-space, the edges will by definition form closed curves. This simplifies selection of salient edges, and a novel significance measure is proposed, by integrating the edge strength along the edge. Moreover, the scale information associated with each edge provides useful clues to the physical nature of the edge. With just slight modifications, similar ideas can be used for formulating ridge detectors with automatic selection, having the characteristic property that the selected scales on a scale-space ridge instead reflect the width of the ridge. 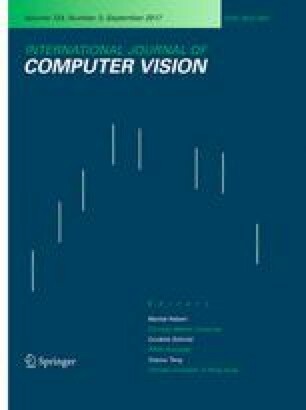 It is shown how the methodology can be implemented in terms of straightforward visual front-end operations, and the validity of the approach is supported by theoretical analysis as well as experiments on real-world and synthetic data.